The Crunch GTR series full-range speakers offer exceptional sound quality and extraordinary cosmetics. These high-performance, in your face-attitude speakers were built to be seen and heard. On the road, they can't be beat. The GTR series speakers incorporate technological breakthroughs found in hi performance home audio speakers. 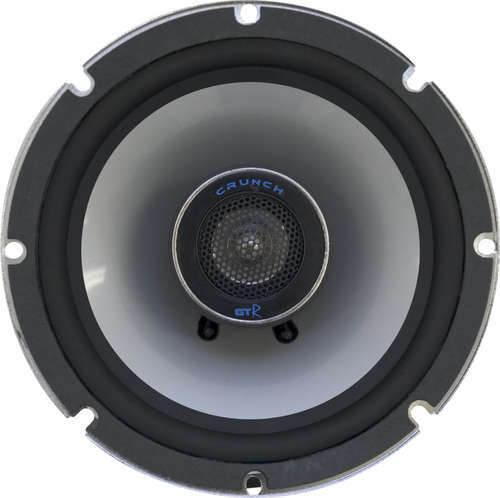 The new GTR low-profile speaker frame designs insure this speaker series will easily fit into over 90% of the standard OEM speaker openings. The GTR series speaker's Silver IM Polyprop composite cones are made from the same hi-tech material used in many hi-end home audio speakers. This polymer composite allows the speaker cones to be very lightweight, making it easier for amplifiers to power them. The silver IM polypropylene composite makes the GTR cones extremely rigid and strong. Therefore, GTR cones are very responsive and accurate plus highly resistance to flexing. GTR's Silver IM Polypropylene cones combination of low-mass and high-rigidity results in tight low-frequency response and incredibly detailed music with superior imaging. The GTR Series speaker design continues with a Neo-powered soft dome tweeter design. The GTR soft-dome tweeters utilize a specially designed anti-resonant, damped rear chamber. The damped chamber behind the dome tweeter decreases standing waves and lowers the tweeters resonate frequency, which results in very wide imaging, high-frequency reproduction. The GTR tweeters feature a powerful rare earth neodymium magnet for increased power handling. Between the chromed GTR Series speaker frames and the IM polypropylene cones rests butyl rubber surrounds that provide a sonically superior termination point for the sound wave as its launched off the speaker cone. Longer lasting and better sounding than foam surrounds, the GTR butyl rubber surround better seals the out-of-phase back wave, produced by the speaker's backside, thus keeping it from reaching your ears and in-turn the GTR Series bass reproduction is greatly enhanced. Give the new GTR Series Speakers a critical audition. Their precise dispersion of sound, staging, and better imaging give your vehicle a larger listening sweet spot. Now the missing key ingredient to getting great music on the road is the music itself and that's controlled by you. Just add a Crunch USA amplifier to complete your new car audio system. We guarantee our new Crunch GTR speakers will cause quite a commotion on your street.